The continuation of China's successful rise depends considerably on the capacity of the Chinese government to prevent and manage a wide range of potential and actual crises, which could, if mishandled, have serious adverse consequences for China. These potential crises are both domestic - where the example of the collapse of the Soviet Union is well understood and remembered in China - and, increasingly, as a result of China's ever closer involvement in the global system. 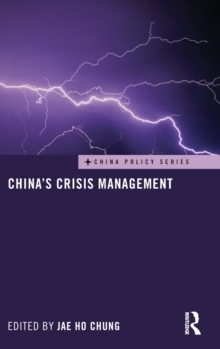 This book presents a comprehensive overview of crisis management in China, and examines China's mode of managing economic, political and military crises, as well as natural disasters, ethnic-minority issues, environmental and public health problems. In each area it considers the nature of potential crises and their possible effects, and the degree to which China is prepared to cope with crises.